E-Waste disposal might not seem like anything out of the ordinary but this is a meticulous and complex process that requires a very careful and skillful approach. More importantly since the effects of improper E-Waste disposal are extremely dangerous and can cause several health and environmental issues people are urged to properly discard of their electronic waste in order to ensure the health and overall safety of the public and the environment. Extremely hazardous materials can be found in most electronics manufactured today . For example ferrous metals, copper, aluminum, plastics and other potentially toxic substances can be found inside many common electronic products and if discarded incorrectly can have have a very negative impact. Pollution, water contamination, health issues and even loss of life can be a result of improper E-Waste disposal and though it might be difficult to generalise and pinpoint the material content of every single device people should still make it a priority to exercise proper E-Waste disposal practices or recycle their items. With more advanced forms of technology constantly being introduced the production of E-waste has surged to an estimated 50 million tons each year. In the U.S alone up to 30 million computers and over 100 million phones are discarded annually. Out of these figures a large percentage of the E-Waste generated is improperly disposed of. In an effort to deal with this growing challenge regulators throughout the country have enacted legislation like the Resource Conservation and Recovery Act to enforce safe E-Waste disposal practices. Many people might not know how or what is the best way to dispose of E-Waste so instead of resorting to illegal and improper E-Waste disposal contracting the services of professional waste removal services would be the best way to manage this. With a professional waste removal service provider your waste can be managed easily and these services come complete with all the necessary equipment and trained personnel to remove E-waste in the safe and correct manner. Furthermore they also facilitate the transport of items where they are later processed. These services have proven to be very effective and have been able to help with the growing concern of improper E-Waste disposal however it is still very important for people to act responsibly and make sure they exercise lawful and eco-friendly waste disposal. Here at Junk King we specialize in the removal and processing of all types of waste including E-waste. Benefit from our top rated professional services with little or no hassle to you and remember we also transport and process your waste with no additional or hidden fees. These services play a crucial role in our lives as they aim and assist in keeping the environment clean and the general population safe. 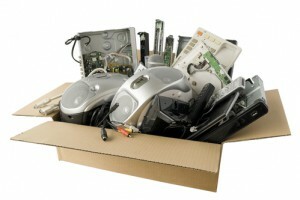 So to get your E-Waste removed visit our website at www.junk-king.com to book online or call us at 1-888-888-JUNK to schedule an appointment right away. This entry was posted in Uncategorized and tagged electronics, e-waste, hazardous waste disposal, junk hauling companies on September 19, 2017 by Julian Torres, "JT". Last updated October 26, 2017 .